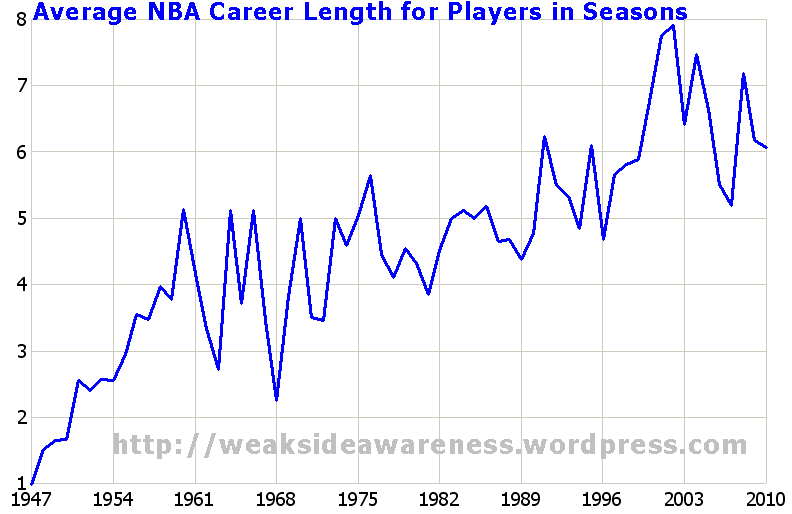 For example, how average NBA career length has changed through league’s history? Is it so much longer now than it used to be? How exactly is it calculated? How does this average career span differs for NBA starters and deep reserves? I’ll answer those and many more questions in this post… but let’s start with the description. I collected data from basketball-reference.com for every season from 1946-47 to 2010-11, then I removed multiple occurrences in one season [usually due to trades] and finally counted how many times player appeared on the list. Simple, right? Such sequence gave me an average NBA career length of 4.869 seasons for 3668 players. Here’s an average for all players who finished their career in any given year. So it is longer than it used to be… but the biggest rises occurred around the time when expansions happened so that’s probably just an effect of creating more jobs in the NBA. 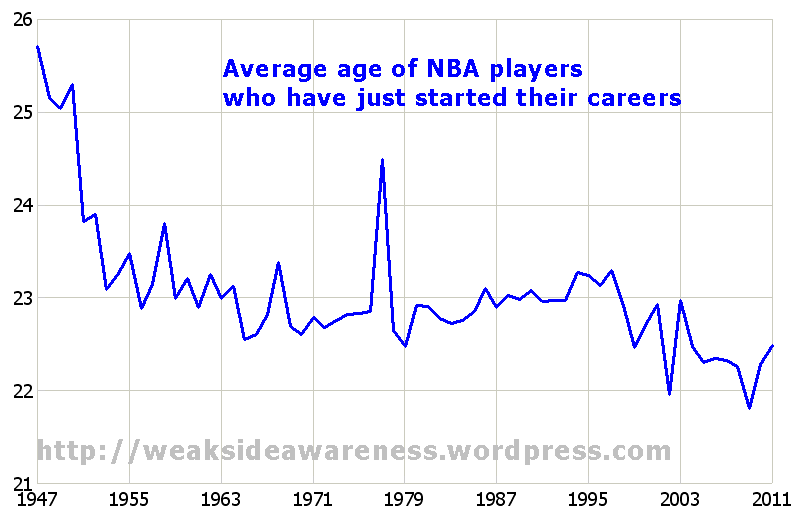 Keep in mind that before 1976-77 season NBA added 4 new teams to the league and there were some 30 years old rookies… Also we can easily see the effect of recent draft age limit. even if he only got a try-out at the end of season and failed. Shouldn’t he be happy that he got a chance? Should we even count that as a “career” or was it more a chance at one? What’s the average career length for NBA Players in various rotation roles? Minimum of 41 games played in a career = 6.18 seasons. NBA All-Star at least once = 11.36 seasons. Height of 7 feet or more = 5.78 seasons. Height from 6-7 to 6-11 = 5.43 seasons. Height from 6-3 to 6-6 = 4.51 seasons. Height 6-2 or below = 4.12 seasons. 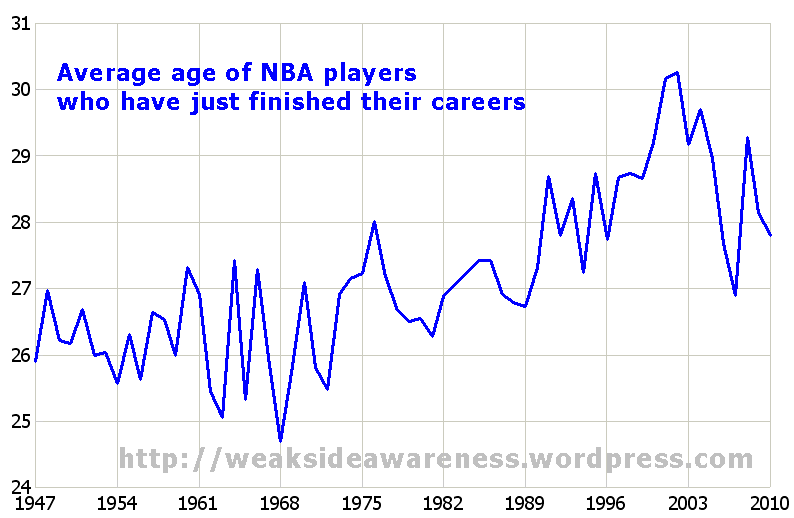 Me and my dad are trying to determine why the average career length is lower for shorter players. What are everyone’s thoughts? He thinks it’s attributed to the physicality of the league so shorter (smaller) players get “beat up” more than taller (bigger) players causing a shorter career. I think it’s because the majority of players who are 6’2″ or under dominated the league in the early days where career length was shorter than today, which skews the average career length for shorter players. What are everyone’s thoughts? Any other ideas why taller players have a longer career on average than shorter players? I would guess shorter players partly rely on their speed to get around blocks, shot quickly, etc. When you get older, your speed might decrease. Your point is spot-on. If we focus only on length of careers since 1980 average is pretty similar among those 4 groups [all around 5,5 with 6-3 to 6-6 the lowest at 5,1]. I would add one more possible factor: there are way more shorter players so it’s easier to replace them.